Changing the hue of a particular piece of digital paper or embellishment is a simple and effective way to extend the life of any digital scrapbook kit. I generally like to open all of the elements I would like to coordinate. Doing this allows you to make sure that they will match. In this case I already had my page built, but it was pink and I wanted to use it my baby boy. Once you have your have you element open. Changing the hue is incredibly easy. 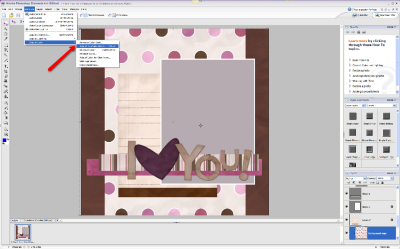 For this tutorial Adobe Photoshop Elements 4.0, but most programs will be pretty similar. Select the layer you would like to change and then go the top menu bar. 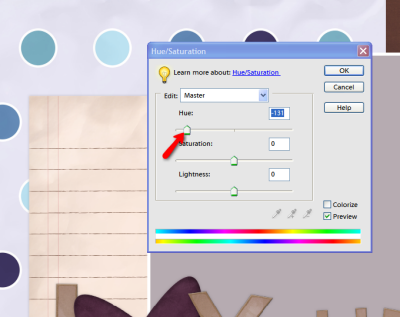 Choose Enhance > Adjust Color > Adjust Hue and Saturation. You can now slide the bars until the color looks how you want it to. Sometimes it is easy to get the prefect look, others it can a little experimenting. 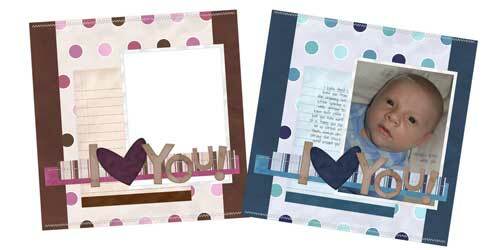 If the items you are are working with have mutiple colors it can be particularly tricky. If you use the drop down where it say Master you can select particular colors to chage. Know all you need to do is repeat the process of all of the papers and elements you wish to change.